Furry adventure in Space! 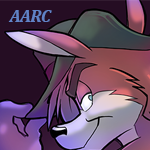 Join the AARC team as they battle space pirates, rescue damsels in distress and occasionally break the fourth wall! On the last panel you can see how the author lost hishers interest. Been more than a month overdue now. I'm getting concerned.